The promenade is expressed as a graceful arc which responds to the seasons. Majestic rows of trees line the path, providing shade in the summer and places of rest on benches below. Fall brings a symphony of color, as the trees turn from gold to orange then to red, finally dropping their leaves in the season of silhouettes. During winter, the ash-grey bark of the formal plantings create a contrast of color and texture with freshly fallen snow. In the spring, vibrant beds of flowering plants including red poppies announce the entrance to the Tribute as a tie to the memory of our veterans. 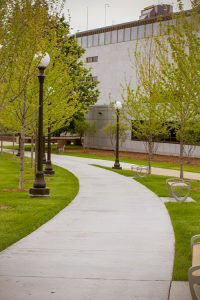 The beauty of the Thank You Military and Veteran Family Walkway in all seasons symbolizes a sweeping gesture of gratitude to all of Minnesota’s military families and creates a feeling of home for them and all visitors. The Walkway is designed to support and embrace the existing memorials. The broad, open lawns on the north side of the Walkway provide an area for families to program large gatherings and events.